Don’t close your reader, you have no worries that I’m about to pass along some trendy recipe that I read about on Epicurious or that I’m planning to promote some cool restaurant which serves sweet bees. Instead, sugared honeybees are all about Bee Daddy’s and my attempt at responsible bee keeping. The varroa destructor mite is one of several pests which plague honeybees (and their keepers), but is arguably the worst of the lot. 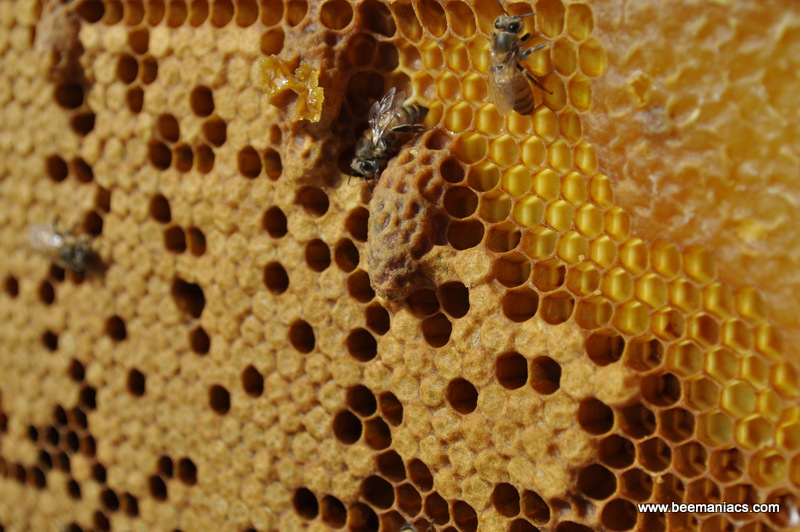 Varroa mites reproduce in honeybee hives by laying eggs on the bee larvae after the larvae cell is capped. The mites leave the cell along with the young adult bees and spread their menace throughout the hive–and beyond. Varroa mites spread viruses and other diseases which can disable bees and eventually, cause hives to collapse. There are honeybees which have proven resistant to varroa mites because of their fastidious grooming habits. 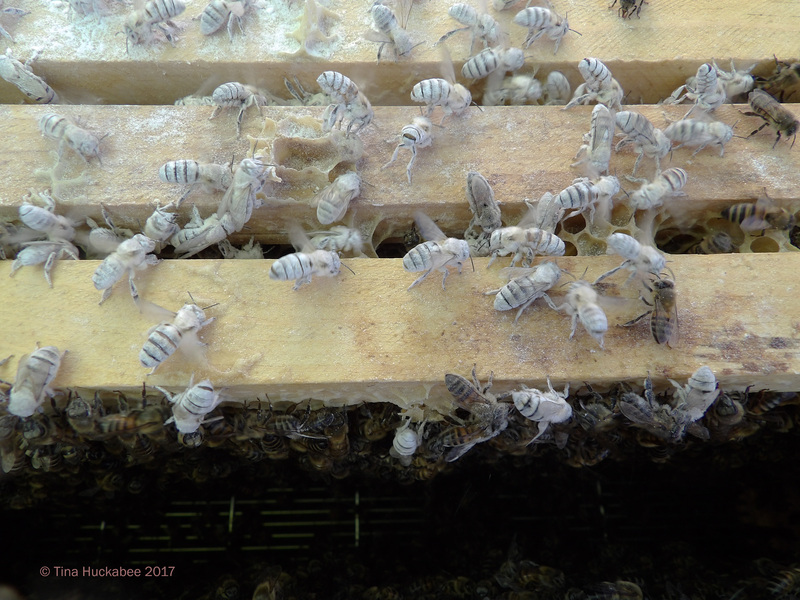 BeeWeaver Apiaries touts their bees as varroa resistant and we have certainly had good fortune with our BeeWeaver bees, though we lost a hive, Mufasa, in December 2015 because of a mite overload which we didn’t initially recognize until the bees were so diseased that they died. 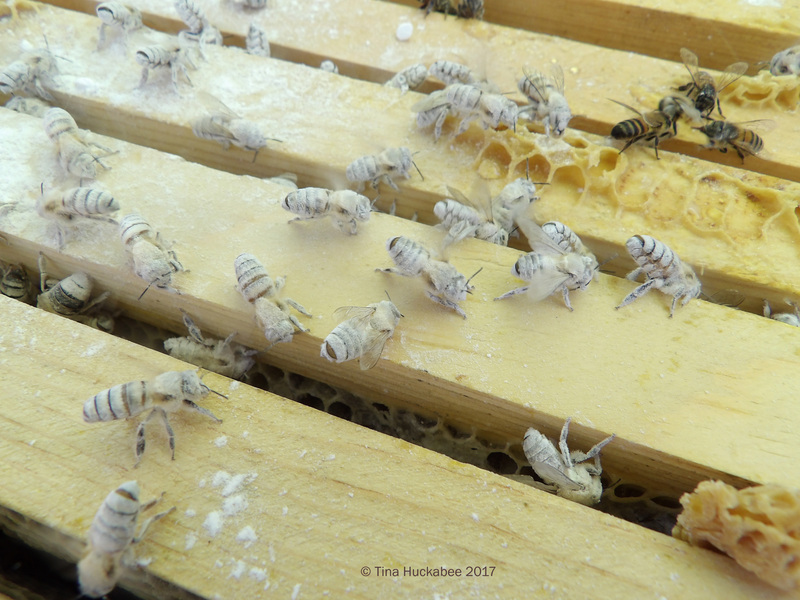 Even BeeWeaver bees occasionally succumb to varroa infestations and because of that, going forward in our beekeeping endeavors, we’ve committed to checking our bees the recommended four times per year. We could check for varroa mites using an alcohol wash, but bees would die in the process and this Bee Mama just can’t do that. So, sugared bees, specifically powdered sugared bees, it is! We’ve read about the varroa check ‘sugar roll’ and watched a couple of how-to videos. 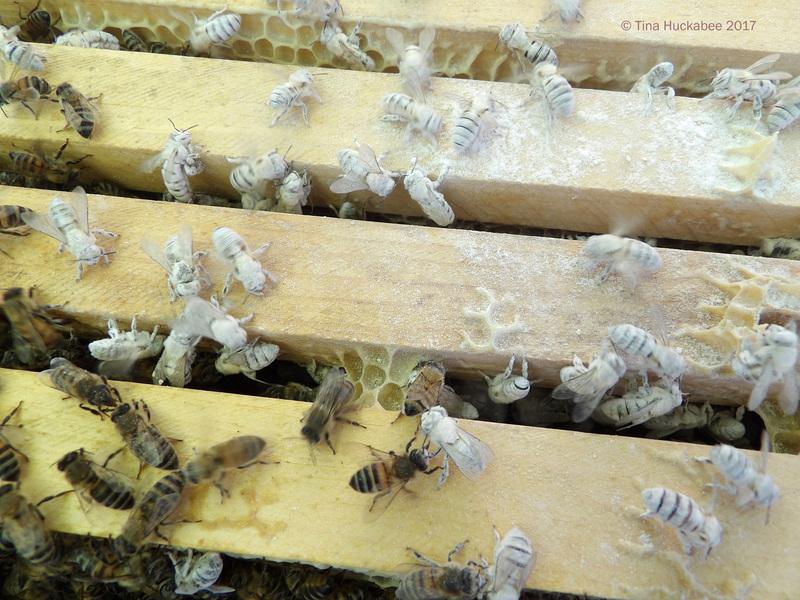 Last week during our twice-monthly hive check, we sweetened the pot, or rather, the hive, to check for varroa. 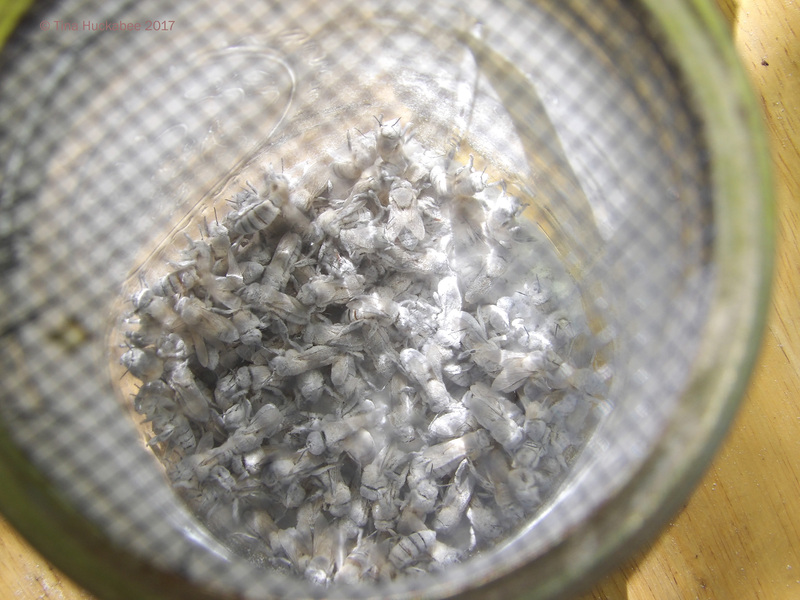 …which included a container in which to dump bees for the check, the powdered sugar, a half-cup measure, a glass container with a net fitted over the top, and a white paper plate for the final look-see for varroa mites. 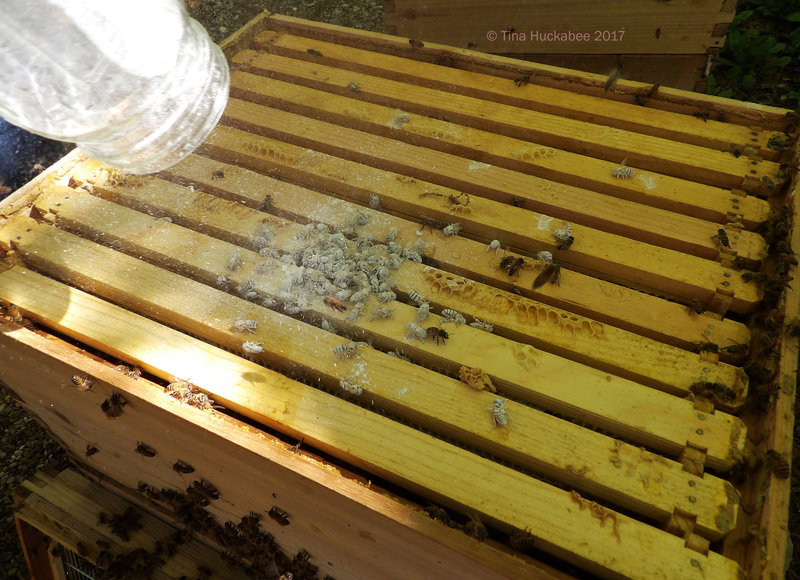 With equipment on hand and from each of our three hives, one at a time, we pulled a frame with capped and uncapped brood and nurse bees in attendance, since that’s the most likely place to see varroa happenings. We looked thoroughly for each queen on each frame–rolling your queen is not a great idea, because she could die in the process–not likely, but a possibility. 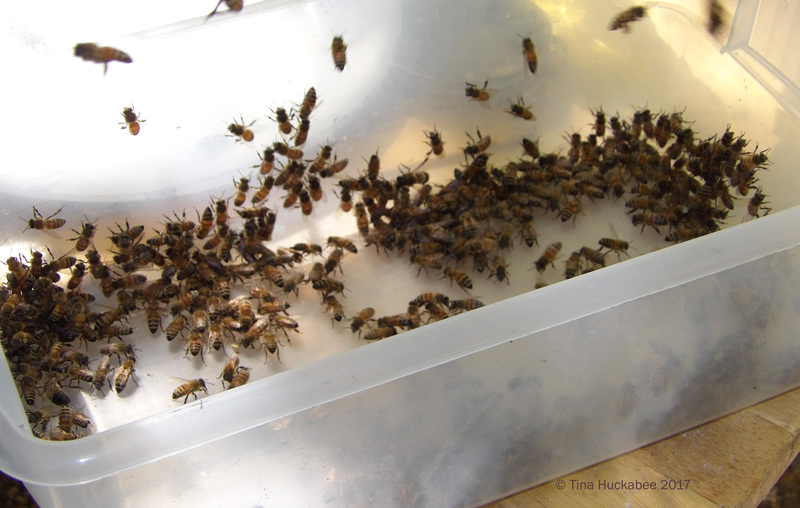 The directions state to check for varroa with ‘1/2 cup bees, lightly packed’ as that equals about 300 bees and is a good number on which to base a mite count. 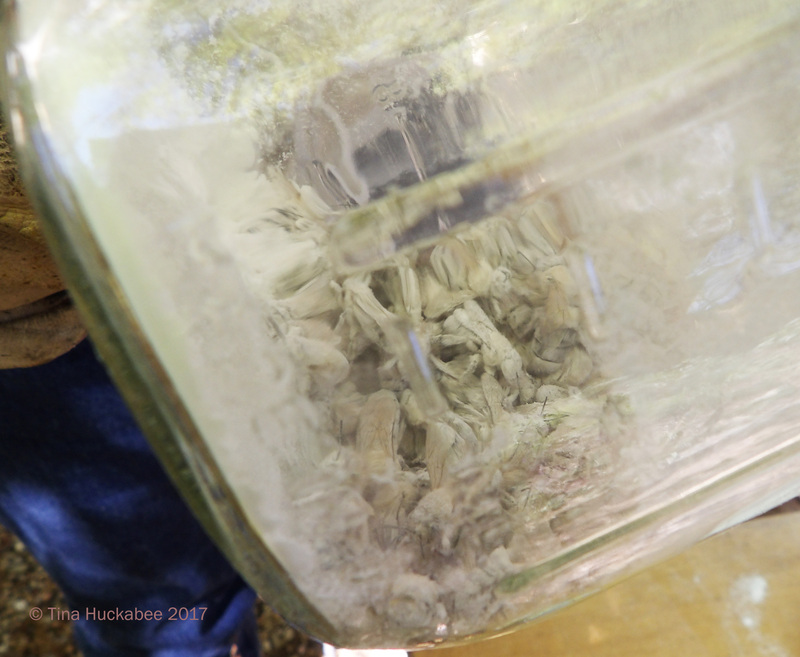 The process is to pull the frame and tap it so that bees fall into a container. 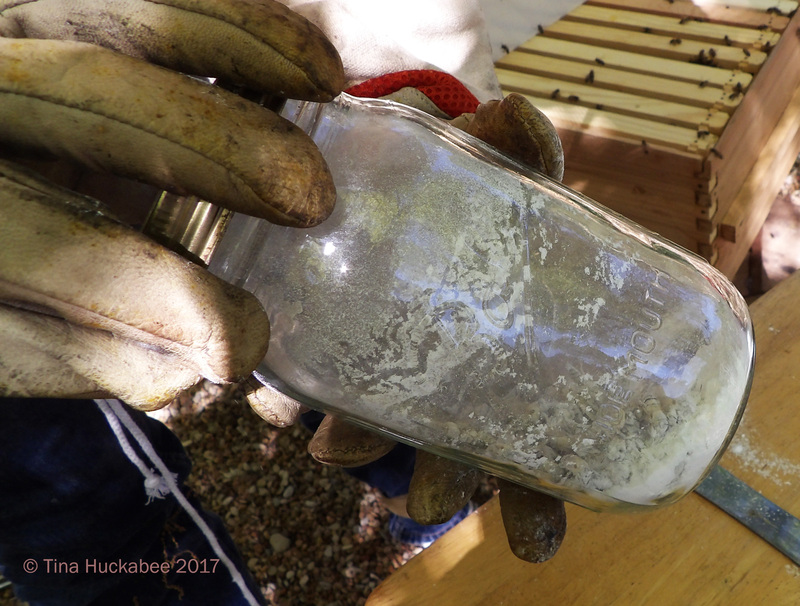 We quickly scooped the bees into the half-cup measuring cup and plopped them into the jar with a couple of tablespoons of powered sugar ready and waiting to cover bees. Bee Daddy rolled the bees-in-jar for a minute or so and then allowed it to sit for a minute or so. We placed another tablespoon of sugar through the mesh and repeated the process. 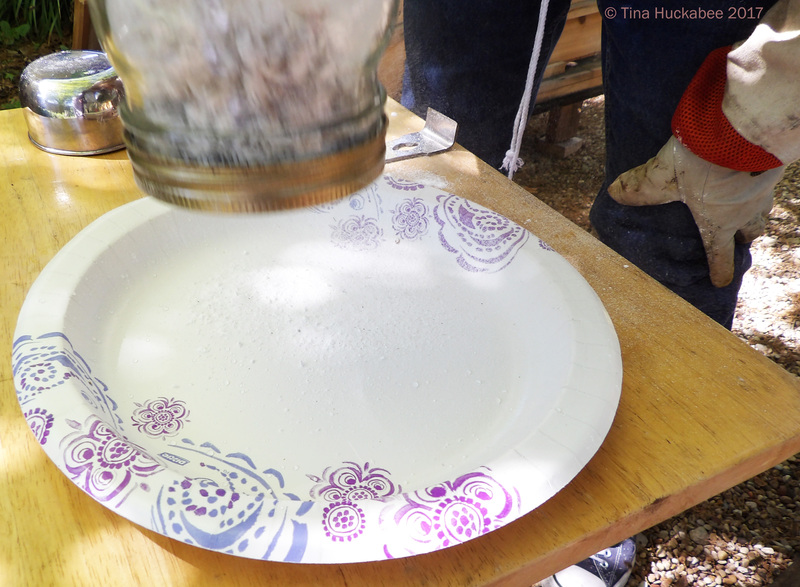 Another set of shakes over the white plate allowed the sugar–and any mites therein–to fall off of the bees (the sugar makes the bees slippery) and on to the plate where they’re visible. I sprayed the plate with water prior to the shake, then again once sugar was on the plate, just to make the visual clearer. It’s not all that obvious from the photo, but a mite (from Woody) is the middle of the plate. 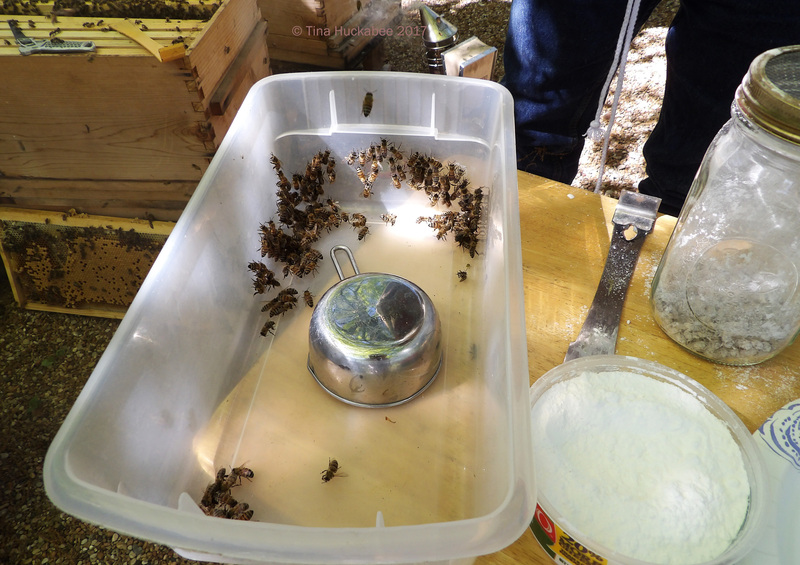 Once we’d rolled, poured and checked, it was time to deliver our sugar-sweet and annoyed bees back into their respective hives. I can only imagine, knowing how much honeybees like sweet stuff, that these sugared bees are the hives’ inhabitants BBFF–Best Bee Friends Forever–as they come back into the hives. The mite count in our hives was excellent: Buzz had no visible mites in the check (though realistically, there are probably mites somewhere in Buzz), Woody had only one mite, and Scar had three mites. That’s a good start to our season. We’ll check again in June, in August and in October/November. 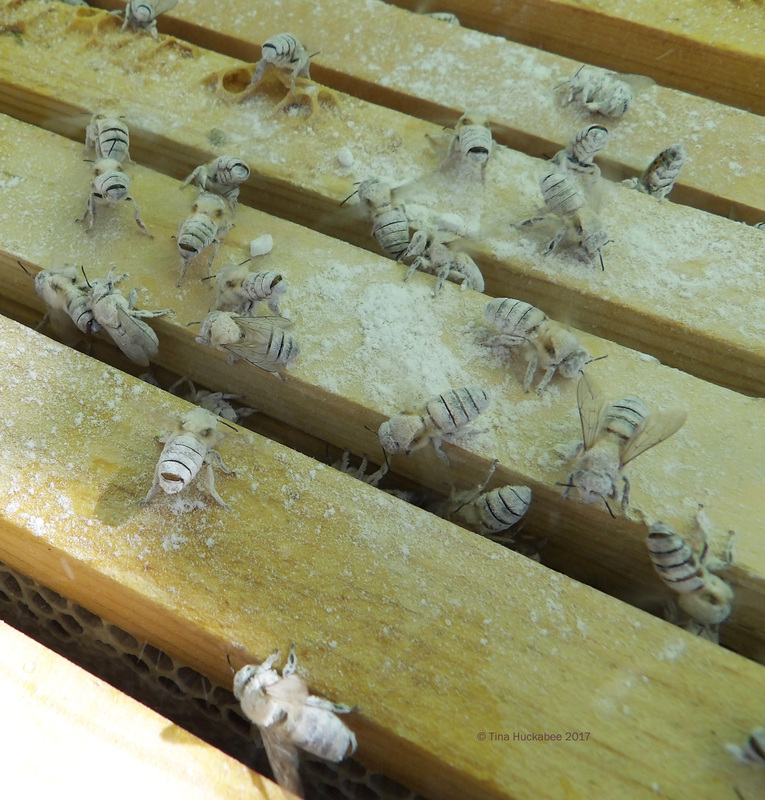 It wasn’t hard to check for varroa, though it’s one more duty we must add to our repertoire of beekeeper activities. 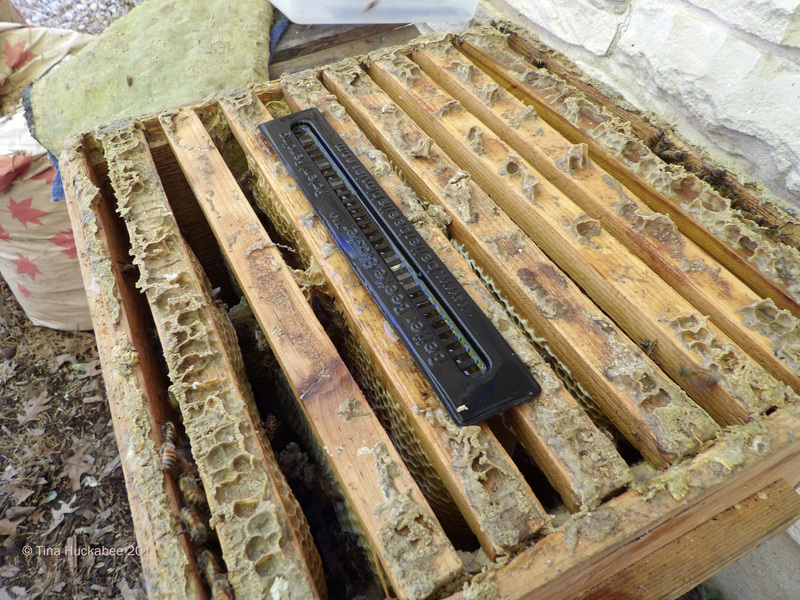 While we were nose-deep into our hives, we also performed a general check. We found some more queen cells in both Buzz and Woody (as I described in Tight Quarters) and also, interestingly, some supersedure queen cells in Buzz. No photos, I’m afraid, because this was toward the end of our lengthy hive doings and my hands and gloves were simply too sticky with honey-goo to work with a camera. (Have you ever cleaned a camera after taking photos with honeyed-fingers?) Because we’re working quickly, there’s no time for the niceties like washing hands. You can see a photo of supersedure cells here. So what is this kind of cell? 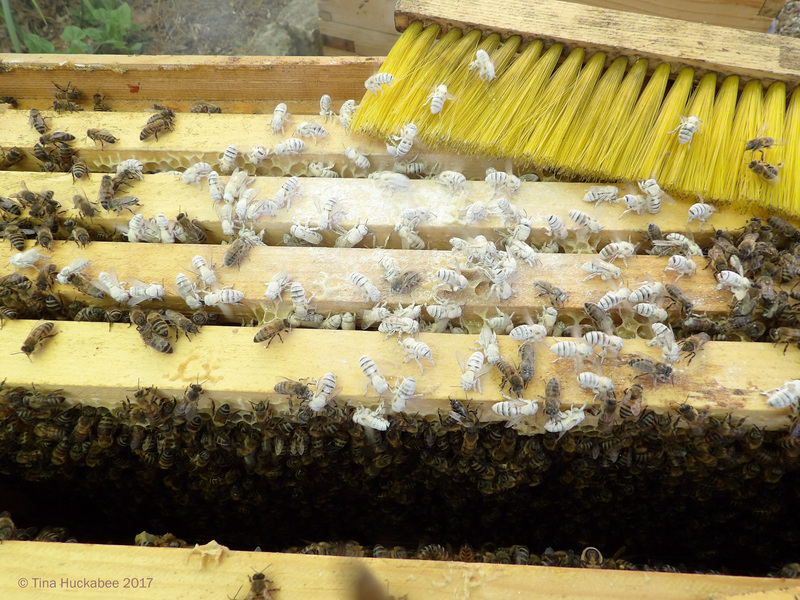 It’s an emergency queen cell and found in the middle of a frame, rather than at the bottom, like a “normal” spring swarming queen cell. And what does it mean? It means that either Buzz’s queen is dead, injured, or simply so weak that the hive decided they need to make another queen ASAP. And what did we do? Nothing. We decided to leave the four supersedure cells that we found and we’ll see what happens. We’re learning as we go and willing to take some risks. At least that’s what I keep telling myself. The queen who emerges first will kill the others. Honeybees live an Apis Game of Thrones kind of life and there’s never a dull moment. Scar, I’m please to state, was a revelation! 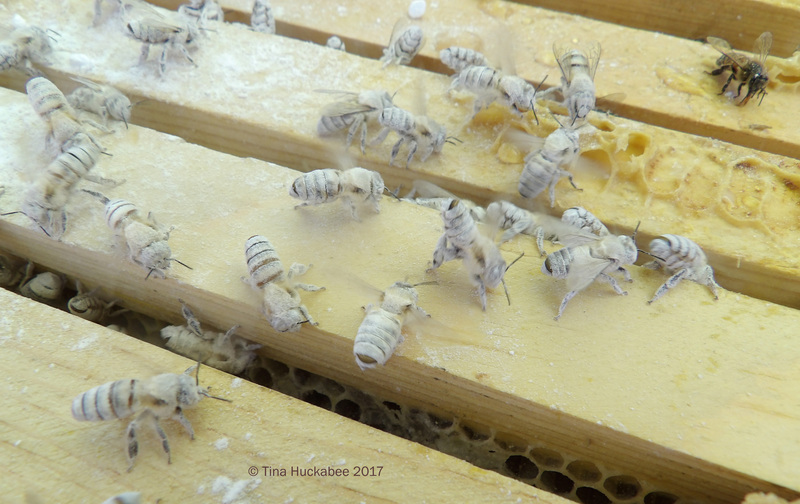 In our first hive check of the year, back in late January/early February, and chronicled in Ramping Up, we didn’t find any brood in Scar and determined that the queen had died. We decided not to re-queen her and let the workers live out their days, as we have two healthy Langstroth hives (Buzz and Woody). 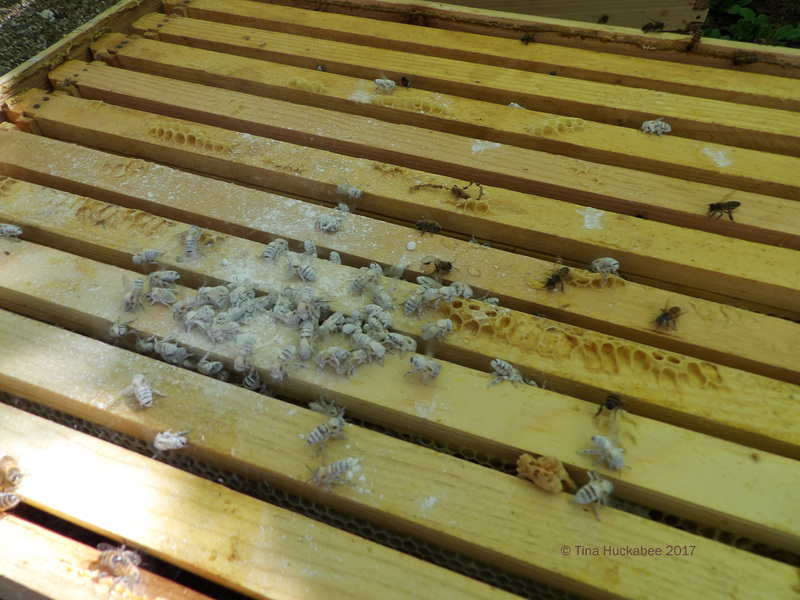 For the varroa check, which we felt obligated to do for Scar, we pulled up several top-bars and found a perfect laying pattern of capped brood! (In fact, a better laying pattern than we viewed in either Buzz or Woody.) Scar lives! She is alive and well with a strong queen–at least for now. Scar, in bee keeping vernacular, is queen-right. Since Scar looks good, we opted to try a new method of small hive beetle trap. Scar has always struggled with hive beetles, though generally, has proved strong enough that the beetles are more of a nuisance, than a real threat. We’ve purchased special hive trays that are placed in between frames (or in Scar’s case, top bars). There are slats at the top in which we poured a commercial oil, made for bee hives, into the slats. The bees are too large to get into the holes, but the beetles are just the right size and oil is attractive to them. 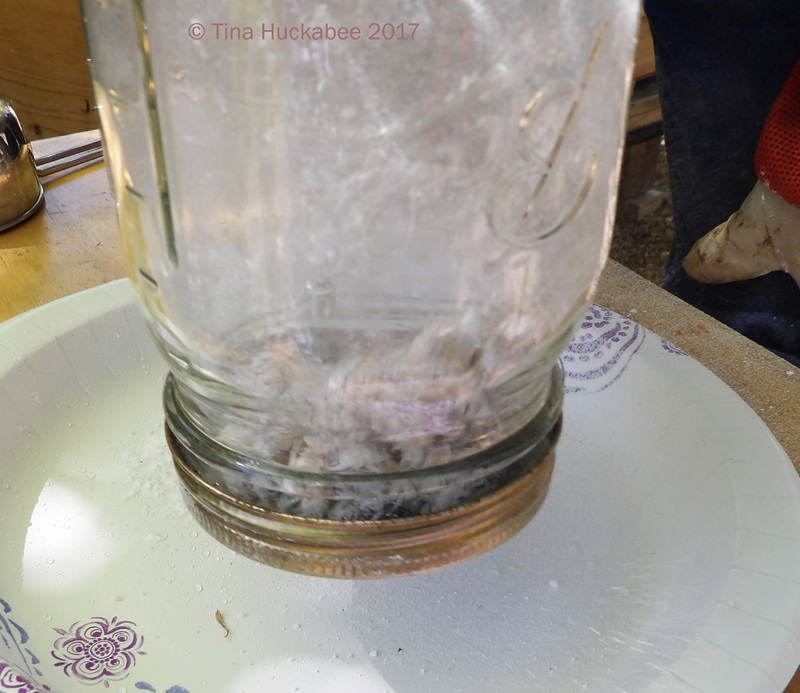 I’ve spoken with several bee keepers who swear by this method of integrated pest management for their hives, so we think this method is worth a shot. We’ll see if it works to lower the beetle count in Scar. So far, neither Buzz or Woody have had more than a few beetles, but hive beetles are common in most Texas honeybee hives. Our honeybees. It’s been a busy season so far and they never fail to keep things wild and keep us on our toes. “Queen right”… I just love knowing the proper terms for these situations. Your sugared bees look a little ghostly. Or perhaps the temporarily pale bees will be seen as “fashion forward”? 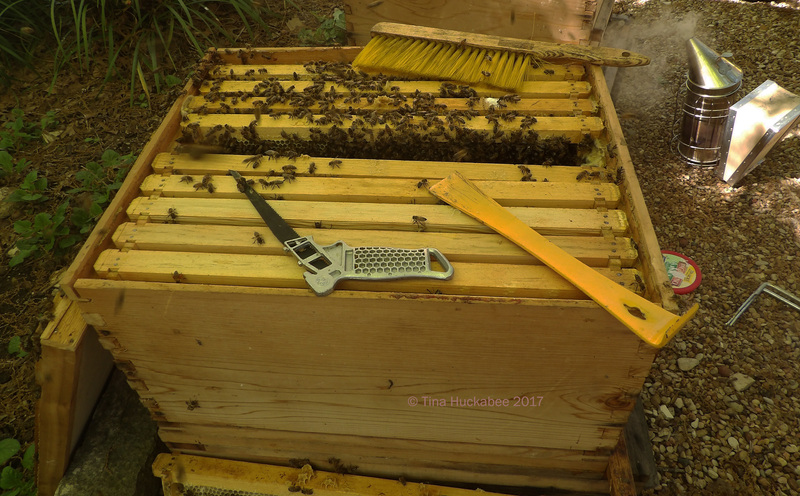 It is certainly no surprise that you and Bee Daddy are so fastidious with your bee-keeping including mite and queen checking. The fact there are so many moving parts to track in order to “keep” responsibly is good to know and (quite properly) daunting. If anybody deserves to share the hive’s honey it is you! Bee keeping enjoys lots of weird terms, some of which I’ve been reluctant to adopt, but there it is: I’m a bee keeper. We should have been doing these varroa checks all along, but I think we needed to achieve a certain comfort level with activity more complex than just a regular check. That said, the varroa sugar roll wasn’t that hard, so, yeah, sugar on! Really interesting. I didn’t know so much went into beekeeping. Neither did I. 🙂 Actually, we’ve eased into this, though it may not read that way. Taking honey (once or twice/year), checking (twice/month) and keeping a keen eye on them are the regular requirements. Tina a super interesting and wonderful post. The Varroa mite is lethal to hives. I feel the loss of his hive Mufasa because of him. 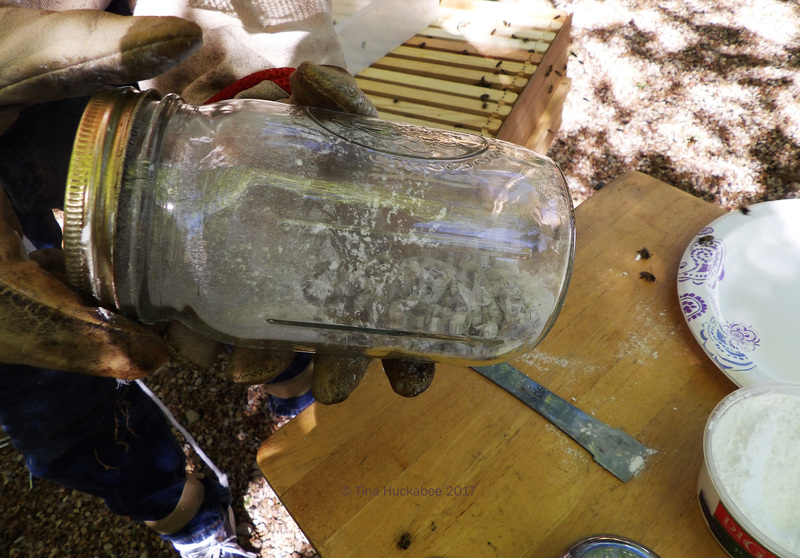 How interesting it has been as they have filled their bees with sugar powder to find out if the hive had the Varroa mite and how well photographed all the steps. It has been a first class beekeeping. I’m so glad that the Scar Hive that I remember had no queen now has it and is going terrific. I feel that I have beetles from the Beehives: with the new trap I hope they all die. The photo of supersedure cells is spectacular. To be if with luck the queen of Buzz recovers. Every time I like beekeeping more and that’s thanks to you, Tina. Thank you very much for your teachings. Forgive me for talking about their hives as if they were mine as well, but they have “hooked” me and I feel sorry for them. I look forward to your next post. Greetings from Margarita. Haha! I’m very glad you like the hives so much that they’re “yours”–that’s sweet. I’ll keep posting about the bees as I find them fascinating! Thanks Tina for a very interesting post. I think Australia is one of the few countries that don’t have these mites. There is another bee mite, varroa jacobsoni, that has been discovered here in northern Queensland late last year and affects the Asian honey bees. The Government has made it law to report either of these mites if spotted. It’s very worrying. I still don’t think people truly understand how important the little bee is to our survival. As if the poor bees don’t have enough problems to contend with! Yes, you’re correct Sue–there are no varroa in Australia, though I’m sorry that something else has been found. Yes, it’s daunting what the honeybees have to put up with. I’m so glad the hives are healthy and “queen-right”! I was thinking the powdered sugar made perfect sense and then, as you say, made the covered bees extra popular. 😉 If I were a younger gardener, I might think about getting into beekeeping. But I sure am enjoying learning more about beekeeping from your posts! For now, all seems well and “bee-right”! You’re probably about my age, Beth (I saw the pic of you on that horse in Mexico)–don’t let age dissuade you if you’re interested, but there’s a bunch to learn and a time commitment getting hives set up. Still, it’s interesting. And–honey!! A very education post. Loved it. I couldn’t help myself. By the time I got about midway through the post, I was laughing. 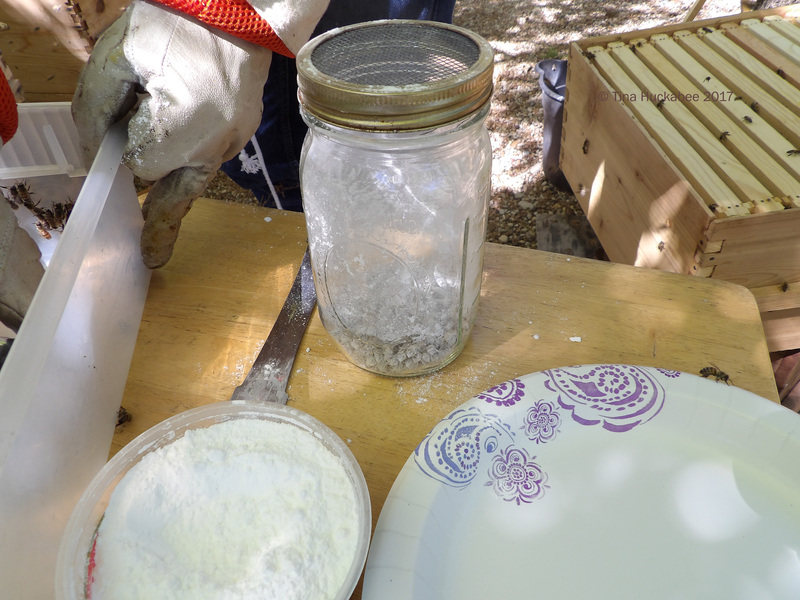 It all seems just so improbable: powdered sugar covered bees! 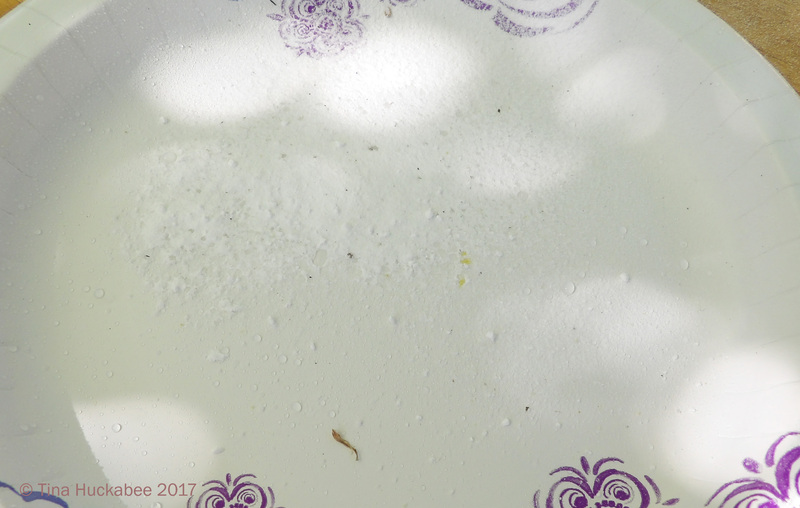 I had no idea that powdered sugar had cornstarch in it, and it never had occurred to me that we could make powdered sugar ourselves. I don’t know what I thought it was. I’m so ignorant of bees — I keep finding statements that bring me up short. For example, “It means that either Buzz’s queen is dead, injured, or simply so weak that the hive decided they need to make another queen ASAP.” How do they “make” another queen? I had a sudden vision of bees gathered around a table, stitching together legs and a thorax and other bodily parts, but I’m pretty sure that’s not it. More exploration is required! Haha. I didn’t know I could make powdered sugar either, it’s one of the things we learned before we did this sugar roll thing. As for how they make a queen, it’s all about the pheromones and the collective’s decision. I’m no honeybee expert, but basically, queen-making has to do with what the nurse bees decide to feed the larvae. Something called “royal jelly” (another of those weird, annoying honeybee terms) is fed, versus the regular stuff, is a big part in what decides whether a bee is a worker or queen. There’s a lot to learn….
! The painstaking process of checking for varroa mites makes one long for the days when American foulbrood was about the only thing beekeepers had to worry about! I’m glad you’re enjoying them, Amy. Unfortunately for the honeybees and their keepers, there’s a fair bit of bad critter activity to keep up with. American foulbrood does have an impressive name though.